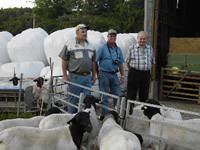 We have been breeding sheep for more than 30 years. 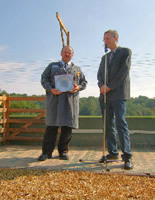 The breed “ Dorper “ was presented at the convention in autumn 1996 by Dr. Otto Thume and immediately piqued our interest. That`s why we chose to breed Dorper sheep. On March 19, 1997, embryos ( with genealogy ) from South-African top-quality herds were implanted into our sheep. On April 16, 1998, Prof. Dr. Wolfgang Holtz from Göttingen University performed another embryo transfer. Thus, we are the second farm ( pioneer farm ) to have implanted embryos in Europe. In relation to breeding Dorper sheep, we decided to sanitize our herd from Maedi. Since August 2000, we have been labelled “ Maedi-free “ by the sheep health service of the epizootic institute of Baden-Württemberg. In September 2004, my Swiss breeding colleague Kurt Zäch and I went to Pretoria to visit the largest Dorper event ( 650 animals ). Over there, I personally met the breeders, who delivered us our embryos, and were able to make some acquaintances with some of the top breeding farms. In March 2006, another trip to South Africa thanks to an invitation of the South-African breeding association in Beaufort-West. We have an average of 100 to 120 ewes (full blood). Our rams (all full blood) are verified and evaluated at the official control station in St.Johann / Reutlingen. Thus, we are only selling controlled offspring from male and female animale. BEN GROBBELAAR - JOHN DELL - MICKEY PHILLIPS - KOENIE KOTZÉ - TIEN JORDAAN - NICK CILLIERS - ALBERT van NIEKERK - ERNEST CONNAN. In September 2006, our friend Ben Grobbelaar, one of the top dorper breeder and judge, and his wife from Petrusburg (SA) visited us. He proposed to judge all my ewes and rams in accordance to the Shouth-African breeding standard, thus giving me lots of suggestions to improve our breeding. We spent some awesome days with Ben and his wife and are already looking forward to meeting them again. On September 2 in 2007, we celebrated our 10 th anniversary with an “ open-house” day: 10 th (1997 – 2007) anniversary herd-book breeding. Sheep breeding – the pioneer work by a Sondelfinger (citizen of Sondelfingen) ten years ago, has grown into an all-time success story. By Elke Schäle-Schmitt. 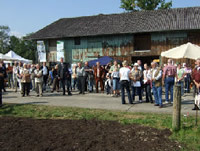 The whole day, visitors from all over the country came to the Lang family`s sheep stable in Bachwiesen. A total of about 3000 visitors watched the sheep being sheared or learnt more about weaving, others tried to felt, while some had some sheep cheese or smoked lamb sausage. Others took a curious look at the bed in the sheepherd barrow or were talking shop, or played on the bouncing castle, depending on age and persoal interest. The reason for this open-house day was an anniversary. Ten years ago, Renate and Eberhard Lang started to breed Dorper sheep. Both families of the two natives of Sondelfingen, have had a long tradition of sheep-farming. Until ten years ago, the Lang`s sideline-agriculture was dedicated to breeding Merino sheep. In 1996,Eberhard Lang first heard of a breed, which is widely spread in South Africa, completely unknow in Europe though: Dorper sheep. The first Dorper sheep came to Baden-Württemberg as embryos. The first transfer took place in March 1997, a procedure that was quite complicated. ... Apart from the Lang family, only one other pioneer breeder, who had the courage to really get involved, existed in Europe at this time. Today, about 25 Dorper breeders have united to create their own breeding association. Everyone is convinced by the advantages of this typical black-headed breed, that is a crossing of Blackhead Persian and Dorset Horn. Eberhard Lang – in consideration of ten years experience – would always start again to breed Dorper. He has become a breeding expert whose advice is constantly being asked in Germany as well as abroad. Several trophies grace the stable`s wall. Yesterday, he was again given the achievement prize of Baden-Württemberg, handed over by Dr. Johann-Georg Wenzler. August 23 & 24, 2008 Federal exposition in Wüsting: Milk sheep, Texel and Dorper. I took over his male and female Dorper sheep (embryo-transferred offspring). Visit of the South-African breeder Ben Grobbelaar from Woelewater Dorpers.